Do not do to yourself what you would not do to others. 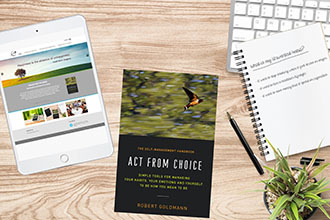 “[Robert] Goldmann thoroughly examines unwanted habits in this helpful book… [It] does an excellent job of describing how humans form and keep bad habits, and it offers a wealth of effective tools and exercises to remedy them... A thorough, conversational guide to aligning one’s habits and actions with one’s intentions." "Wonderful. A twofer— It is written in a style that any overweight smoker can understand and use, and is a finely crafted though easy to understand text book for professionals. A great gift, especially for people raised on guilt." —Doug Jarvis. retired former Senior Vice-President, Cablevision Systems Corp.
"…[In] Act from Choice Robert Goldmann explains [self-management] simply and approachably…The most wonderful aspect of this work is that every step of this guide has been considered from all angles and offered to the reader with kindness and humanity that will assist you in all aspects of your life." —Michael Kay, Financial Life Planner and author, in Psychology Today. “Act from Choice simply dazzles! It synthesizes years of research … undertaken to make sense of suffer-ing, to develop forgiveness, to instill compassion (starting with himself) in his clients and, now, his readers…. The Method he … does not fail to reward." 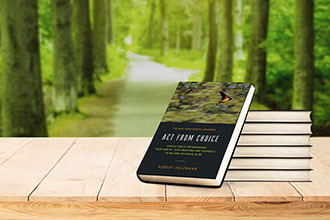 "…Part 1 [of Act from Choice] describes the theory ….It’s comprehensive and as good a work as I’ve found since grad school many years ago, yet easily understandable by the general reader. 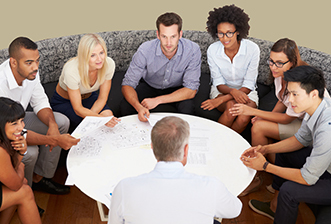 … Part 2…[is] a systematic guide to changing behavior. If you follow the steps, you will get results." "Robert Goldmann has written a book full of compassion, humor, and wisdom about who we think we are, who we really are, and who we want to be, based on groundbreaking science... 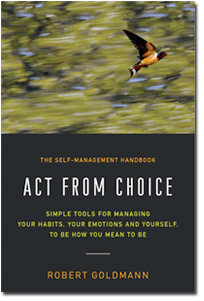 He provides a struc-ture illustrated with dozens of applications to daily life for recognizing and managing those reactions we choose to manage." —Laird Durham, international consultant, magazine writer, and author of the self‐help Prentice‐Hall book 100 Careers: How to Pick the One That’s Best for You. —Steve McElfresh, PhD, Vice President of People, New Relic Inc.
— Clyde Grossman, founder and former Managing Director of Interactive Studio Management, a video game business development and consulting company, and founder of DoNoHarm.us.